Although MLA Vice President Michael Bérubé had been, in fact, a longtime blogger, at American Airspace among other sites, he confessed -- as the final speaker at the Richard Rorty archive conference -- to an "ambivalence about the technologies that we have been talking about" and even declared tongue-in-cheek declaration that "I will not join Facebook," since "the more people who join," the more inevitable it was that "Facebook will become self-aware." Nonetheless, Bérubé also admitted to his pleasure in the fact that "I can watch John Coltrane on YouTube" and marveled that "the ancient library of Alexandria" might be "available on Google cache." As he explained his method in his talk about "Reading Rorty Rhetorically," Bérubé announced from the start that "I will not read Rorty philosophically." Nonetheless, there were certainly several commentaries on philosophical texts in his hour of remarks. 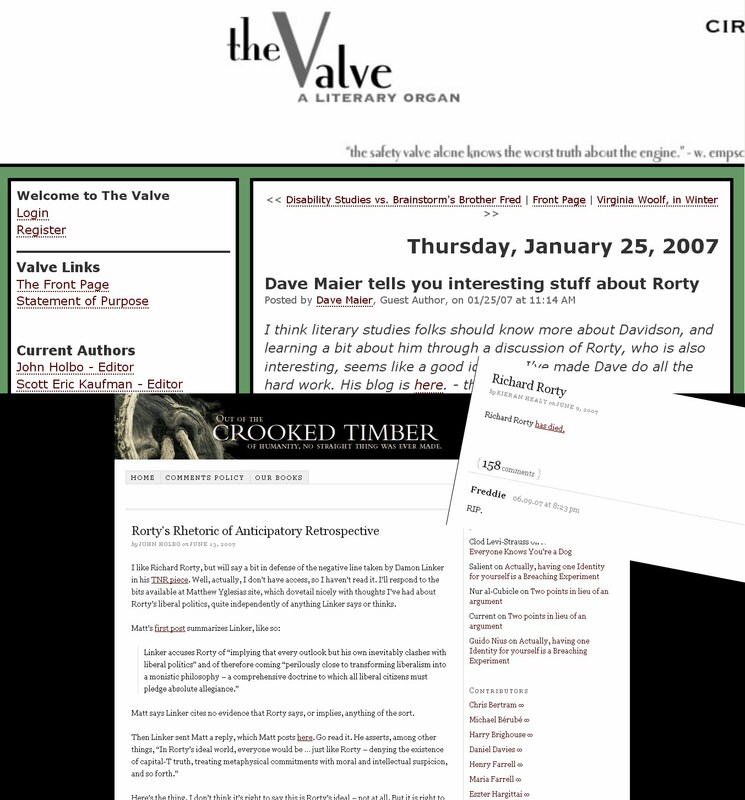 Bérubé began by descibing how he "e-met" Dave Maier when Maier was a doctoral student in philosophy in Columbia and an enthusiastic commenter on The Valve, an online literary publication that has often been cited as an example of the future of e-scholarship, particularly when it comes to more copious reviews of academic work that bridge academic publishing and the academic blogosphere. He reminded the audience of the number of postings, not always sensitive or nuanced that appeared in response to the short, declarative sentence "Richard Rorty has died" and the fact that 4,000 word posts about Rorty (and about his own work) are not uncommon in the blogosphere. For example, Bérubé noted the lack of print reviews for What’s Liberal about the Liberal Arts. (The book did earn, however, an amusing graphic novelization here.) However, Maier provided an in-depth reading of one section of Bérubé's book in a posting on his blog in which he cautioned Bérubé against "the cutting of philosophical corners" in his application of Rorty. Maier also was the author of "Dave Maier tells you interesting stuff about Rorty," which Bérubé described as part of a larger debate about the deniability of the existence of "true statements that get things right." In the wide-ranging discussion, Bérubé noted that "the entire exchange took place on blogs." In Bérubé's reading of his exchanges with Maier and others about Rorty and the issue of relativism at the center of the debate and the question of how "resistance to realism must be global," the historical context of the Alan Sokal hoax in Social Text was key. Nonetheless, at one point Bérubé made fun of the continuing discussion of Sokal's fake postructural quantum physics article and indicated that he had grown tired of its many sequels, which he joked could be called The Conquest of the Hoax or Return from the Valley of the Hoax. Bérubé drew the audience's attention instead to "stupid realists tricks that I am not performing" since there was going to be "no teleology" in a cosmology in which "it’s going to be quantum turtles all the way down." In other words, he challenged the notion that physics is foundationalist and insisted that it was "not the template for the rest of human knowledge." As an example, Bérubé cited the existence of Cosmic Background InfraRed Radiation. (If readers want to know more about the subject, I would recommend that they go to this part of an excellent tutorial written by Virtualpolitik friend Ned Wright.) For Bérubé, it is a classic example of Latour's "science in action," since the connection made between two different disciplinary fields was made possible by a social process to enable interpretation when nature was "not talking to us but just chattering." In reading Rorty alongside John Searle, Bérubé wants to address the possibility that "anti-foundationalism" might operate in a different realm of truth than "quarks and Neptune." He urged his critics to "stop conflating natural and the social." Rather than spend too much time on Sokal, he returned to his reading of Sam Harris, the anti-religious author of The End of Faith, which was in the defense of Rorty section of What's Liberal that Maier analyzed. Also important in Bérubé's argument is his own position as the parent of a disabled child. His book Life As We Know It: A Father, A Family, and an Exceptional Child chronicles his experiences as the parent of a child with Down's Syndrome a decade before "disability studies" became a recognized academic field. He talked about the ways that such disabilities challenge traditional notions of "social constructionism" and expose the stereotypical assumptions underlying the hackneyed "nature vs. nurture" debate. He also mocked the "Upper Westside criteria for being human" that are further dismantled here. In this context, it is worth noting that earlier in the day at the Rorty conference, philosopher Margaret Gilbert discussed Rorty's position on human rights, which Rorty had developed most fully in his famed Oxford Amnesty lecture, where he described human rights discourses as driven by "long sad stories" and what he calls "sentimentality." (Gilbert also alluded to Thomas Jefferson in her opening, which caused the eighteenth-century literature specialists in the audience to later remember that this American slave-holding founder of human rights doctrine had read Lawrence Sterne to his wife on her deathbed in his own sentimental scene.) Gilbert's own opinion about human rights philosophy appeared to be that good agreements might be more important than either ideals or pathetic narratives. Bérubé returned to this earlier discussion at least once with a reference to "moral disagreements about the rights of the disabled." Like a good closing speaker, Bérubé also referred back to other discussions earlier in the day, especially the presentations by the two Heideggerian philosophers at the conference: Iain Thomson and Mark Wrathall. He dryly apologized for being a person "not good at fixing alleged bugs in the dualist mainframe." He also discussed the value of "coherence and consensus" in exchanges in which he might "persuade most of you not all of you" based on "standards of evidence and argumentation." He said that he was "not arguing about something that can’t argue back" or obliterating the "distinction between brute fact and social fact" in the process. Rather than thinking about that which might "push back" in a Heideggerian sense, Bérubé was engaging in discussions more on the order of debates like "are there really neutrinos?" Bérubé also described his own uncanny encounter with a remnant left by his younger self when reading in the Rorty archive at UC Irvine. He had found a three-page handwritten note to Rorty, which he had written while a student in Rorty's Heidegger seminar at the University of Virginia. "I actually did this!" he marveled. He also asked himself, "What am I going to say about Heidegger to Rorty?" He explained that he eventually turned in a fifty page paper and thus further established his status at the time as "the graduate student from hell." He also recollected his interest at the time in a particular section of Being and Time about Isaac Newton, which was on pages forty-three and forty-four of his text, and opined that the conjunction between science and philosophy that he had explored remained relevant in contemporary discussions. He shared other memories about Rorty as a teacher as well and expressed respect for his "intellectual demeanor" and the fact that "he gave us essays of people that disagreed with him" and was always determined "to keep a civil conversation going." He also described how in the mid-eighties Rorty gave seminars to true believers on Derrida and then Freud that offered both "possible vocabularies" and substantive criticism of both thinkers. Rather than memorialize Rorty, Bérubé often emphasized the living character of his legacy. At one point he encouraged the crowd to "imagine a Rorty that has the affect of a Žižek." He also suggested that this Rorty might be just as interested in "zoning laws and recycling structures" and other matters quotidian rather than numinous. He even quoted on of the great Rorty ironic lines in this respect: "that’s what a heaven is for." He also praised Rorty for his "clear, declarative sentences." While Derrida often sounded "more like James Joyce than like John Rawls," Rorty penned straightforward sentences like this: "Derrida learned from Heidegger that phonemes matter." As Bérubé exclaimed, "How could anyone would write a sentence like this?" He joked about the intellectual press for which Rorty often wrote and its frequently inferior authors: "Dissent and Commentary merged to form Dysentery." Bérubé returned to his discussion of academic blogging, although he conceded that "you say you have a blog, and people treat you like you own a ferret." Overheated blogging, he seemed to argue, was a uniquely academic pursuit, since "of seven people I have banned from my blog, all but one has been an academic." He granted that the use of blogs for scholarly discussions was creating a "really difficult problem for the archive" with "discussions that are ephemeral" like "seminars happening in real time." How does it go? Rorty wants to change your mind about politics. How does he do it? Not by giving you reasons not to think a certain way. Rather, by inviting you to consider the ‘hopeful’ possibility of a future when ‘we’ will no longer think this way. That is, he imagines a time when the sorts of people he is disagreeing with will, ex hypothesi, have had their paradigm shifted, so that it will simply ‘no longer occur to them’ to think the thoughts Rorty thinks are not useful to think. Holbo finds Rorty's rhetoric ultimately "unsatisfactory." As Bérubé summarized it, "he thought it all went wrong with Sassure" and wants to defend the Kierkegaardian position. Bérubé also argued that all this attention to the "difference between religion and secularism" in the blogosphere "speaks as if secularism is a done deal." Bérubé closed by looking at one more opposition: Rorty vs. Nancy Fraser. In conversations leading up to the conference, he discussed the analysis of Rorty in The Way We Argue Now. In considering Fraser's "Dilemmas of Justice in the 'Postsocialist' Age" and its analysis of "interests and identities" in a"postphilosophical society," he wondered aloud about where we would be going from here. As Bérubé ended his talk, he described a bizarre scene in which critics of poststructuralism gloated when de Man's articles in support of the Nazis appeared and cried, "Now we’ve got you!" to all poststructuralists, even the ones who weren't of the de Man School, such as Lacanian feminists who were already making different claims on truth and objectivity. In defending "philosophy as creative enterprise," Bérubé faced questions from the audience about "pragmatism and romanticism," but the end of his talk turned out to be only the beginning of an evening of socializing in which the day's conversation continued. Update: Bérubé's own wrap-up is here. Well, rather than leaving another hasty and confused comment (partly based on misreading) relating to Heidegger scholars on your blog, I'll write my final comment in response to your interesting summaries about something I do know a little more about, which is physics. When Bérubé says he thinks that when we speak of Neptune or quarks we speak of them "as entities which beforehand already were", as he quotes of Heidegger, there's a bit of a confusion there. What I think Bérubé may be skipping past here (if I understand him correctly) is that there is more to the question of the truth value of propositions than merely determining whether or not they are "true" to some degree of certainty or another, but also to the context in which the propositions live, which in fact is essential to any understanding or use of the propositions themselves. The problem of reference is not just a problem of uncertainty, but rather: what do the propositions even mean? What do the terms in the propositions mean? As Kuhn pointed out so brilliantly in his historical account of the development of physical theories, the meaning of any term or proposition in any scientific theory cannot be taken out of its context, but rather, they exist in reference to an entire paradigm. That is to say, what is at stake is not merely the determination of the degree of truth or falsity of a given proposition, but the proposition taken together with its entire paradigm --- which itself is not possible to define or nail down precisely, for a variety of reasons. An assertion in one paradigm may not even have a translation in another, if the paradigms are incommensurable; even if both paradigms could be said to have utility as theories. In other words, and physicists understand this quite well themselves, the term "quark" is really referring to an element in a theory, which we infer backwards from various observations. The same could be said of a "neutrino" or even "Neptune" --- these are words that fit within a certain picture of the world, but it is not only possible but it has happened many times in the history of physics that terms which we thought had clear, unambiguous meaning, that seemed quite stable and solid, later turned out to be phantoms, that is to say, either convenient fictions useful for a certain level of understanding or within a certain paradigm, but which on further investigation turn out to have been conveniences of thought and approximate conventions which likely refer to phenomena of much more complexity and/or strangeness than we had anticipated. I'm not by this denying that one can reasonably talk about *some* sort of reality or being which existed prior to the invention of a particular scientific theory; nor am I saying that it would be very sensible to suggest that reality prior to the generation of the theory didn't have some sort of patterned-ness to it that is captured by a scientific theory. I am, however, suggesting that to say that a "quark" existed prior to a theory may be saying overly much --- at best, I might say that the entire theory, including quarks and all the other parts of the paradigm which enables one to speak of quarks, likely could be said to have been, in some sense, applicable to the universe "prior" to the discovery of the theory. But the quark itself I think has to be relegated to a mere component of this overarching theory: its very definition and the various corroborating interpretations and experiments themselves are wrapped up in the activity of a community of scientists and humanity and life as a whole.